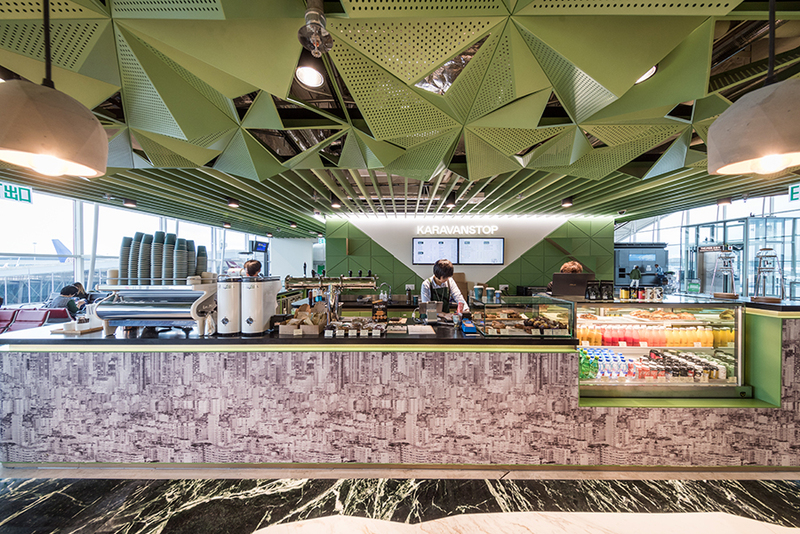 Karavanstop, the new lifestyle café at the Hong Kong International Airport, is designed to capture the spirit of outdoor leisure activities in Hong Kong. The word 'Karavan' comes from caravan; a vehicle equipped for living in, typically towed by a car, for outdoor vacations. Taking an opposite side of Hong Kong being a busy city, Karavanstop designs to celebrate the liberating fun of hiking and camping in the city. The accessible nature and the reputable hidden gems were our main inspiration (and obsession) for the project. 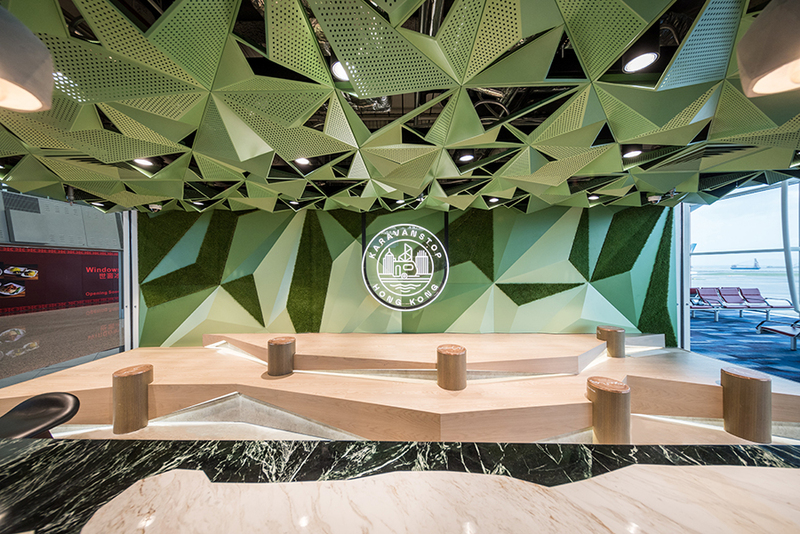 Karavanstop boasts the main features of an iconic green ceiling and 'instagrammable' logo wall taken from the concept of the undulating landscape of mountainous and hilly Hong Kong. The ceiling becomes an upside-down landscape, abstracting the city’s topography. Located in the airport departure hall, Karavanstop is more than a place to get takeaway coffee or quick bites. The choice of furniture is flexible free-for-all seating, from the bar seats to the high table, to the tiered stage seating, are tailor-made to encourage sharing among travel companions. The featured marble high table is inspired by the experience of crossing the stream or river during hiking. The jagged pieces of the three marbles are seamlessly joined to express a running stream. The tiered stage seating stretched the entire back wall, creating design opportunity to blend the seat, the back wall and the ceiling into one continuous component, yet with subtle differences. Tree trunks spreading on the stage function as coffee tables and small information booths to showcase the variety of trails in the region. The bar counter is finessed by a mosaic-pattern artwork, showcasing the high-density cityscape to the travellers. Together with a triangulated feature wall, the reproduced caravan becomes a catchy Instagram spot for travellers to take a photo before taking off. Coffee is like a hug in a mug before the next adventure starts.